Growing your own strawberries opens up possibilities such as decadent strawberry shortcakes and strawberry pies, but none of this can happen if pesky ants get to them first. These tiny insects with a full-sized sweet tooth can wreak havoc on your growing plants. Keeping ants out of the strawberry bed requires a little diligence on your part, but the end result, a bountiful crop of fresh strawberries, is worth the effort. Protect your strawberry bed from hungry ants. Sprinkle crushed mint, bitter cucumber peels or coffee grounds around the strawberry bed. These smells help repel ants. 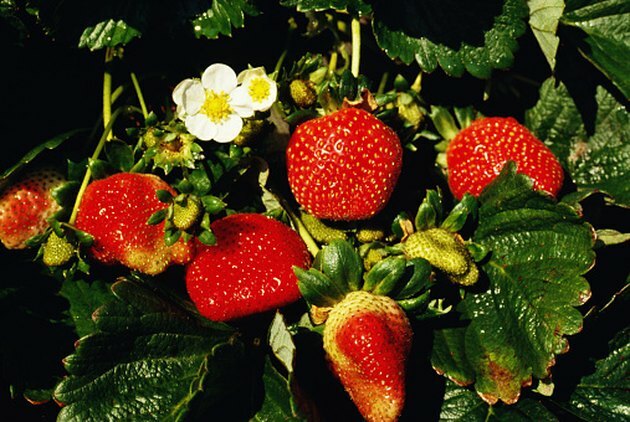 Create a border of diatomaceous earth around your strawberry bed. This powdery substance is safe to use in your edible garden and doesn't hurt children or pets. On a microscopic scale, what feels powdery to us is actually razor sharp to ants. Set traps nearby to distract the ants and keep them from returning. Mix borax with jelly or jam and dab it into lids or small cups for ants to get into. If pets or kids could get into it, use a yogurt container or other small container with a lid and place the bait inside. Poke holes so the ants can get in. The toxic bait kills the ants that consume it, helping to diminish their population. Follow the ants to see where they're coming from. Once you locate the nest, take action to eradicate it. Drizzle dish soap over it before pouring a pot of boiling water into it. The dish soap helps break the surface tension of the dirt, drowning out more ants quickly. Repeat this daily to eliminate your lawn and garden ant population. What Can I Pour on Ant Hills to Get Rid of Them?